The bathtub hopefully won't stay the same color. CH is trying to get a guy who will sandblast and redo it to call him back. 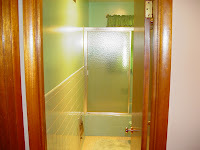 Now I just have to figure out what to with the master bath, although I think CH has ideas! Very nicely done! Wow! Did you and CH do the entire thing yourselves? And will you allow the males in your family to use it? Awesome!!! 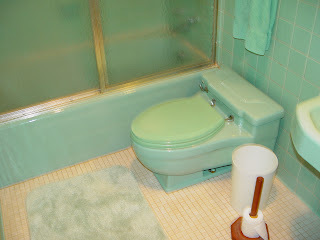 I so desperately want a bathroom makeover... so I'm drooling at this! That looks fantastic!!! Great job! The floor tile looks very similar to what we have in our kitchen. I love home makeovers! Love it! Looks soooo much better. I really like the tile on the walls. WOW!!! It's beautiful, Mary...it looks like something from a 5 star hotel!! I don't think I'd be afraid to use that bathroom (he,he). It looks great! But then what wouldn't after the 50's look it was rocking before? Wow, talk about home IMPROVEMENT! I love the way you did three wall treatments, which I probably would have been afraid to do in such a small space...but it totally works here! The beadboard is fantastic (love the accent in the cabinet, too!) 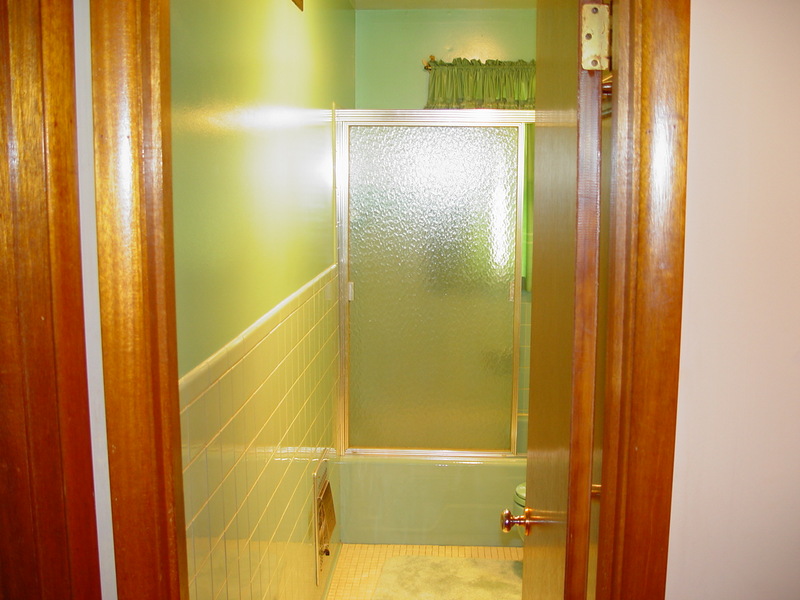 and I think just beadboard and the big tile would have been too overwhelming. Your choice of a nice neutral paint above the chair rail was perfect. And the new fixtures are stunning, as well as the curved shower rod and that shimmery curtain. Looks GREAT! But I'm very jealous. We have been needing to remodel our bathroom for a few years now. We even have the new steam shower--still in the crate. Hubs is slow. Shame, because he can build anything so gutting a bathroom is nothing to him. Motivation is the issue. Looks great! I know you're glad it's done! My mom has an issue with her guest room tub and she was told by a friend it could be painted? It's some sort of special paint...she isn't sure about that and is looking in to just refitting the tub. I can't wait til my bathroom is done...they're supposed to come tomorrow and the forecast is for more snow so who knows if we'll get them here or not. ooohhh!!! Ahhhh!!!! I love it!!!! WOW!! Lovely job!!! GREAT color choices too! It looks wonderful. Way to go. It looks wonderful. Love the walls, cabinets, tile, etc. What a nice improvement. I think it looks great!!! good job to you all for the hard work!! 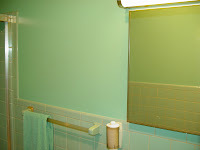 The bathroom looks great! 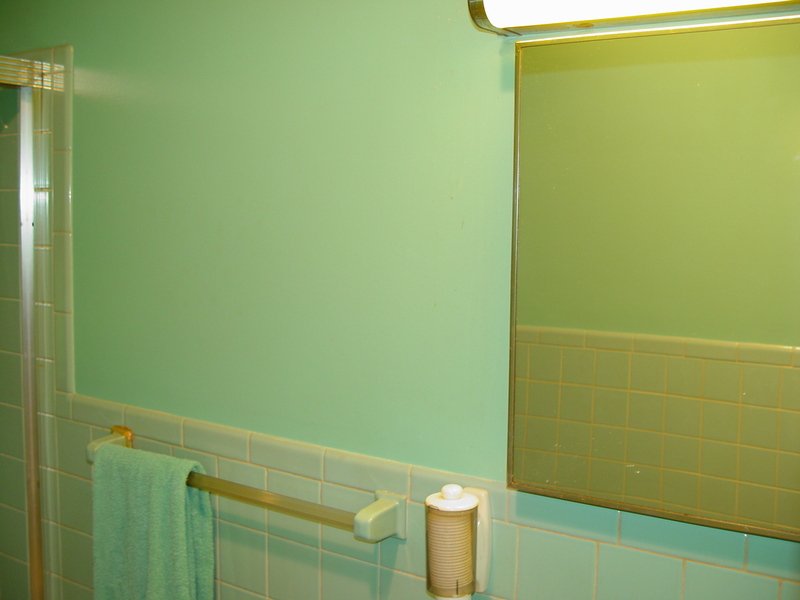 I still think it is funny that we used the same vanity in our bathroom. I need to hurry up and post all of our before and after pics. It looks wonderful. Congrats on living through another renovation! !